Roger Milla and Samuel Eto’o on Tuesday decided to burry their differences following a press conference accorded by the captain of the Indomitable Lions. The two Cameroonian football icons have agreed to resolve their differences. They made peace infront of the journalists and cameras. 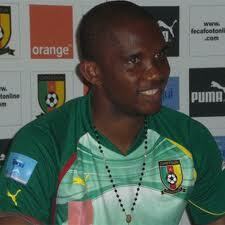 By this strong gesture, Eto’o says he and Milla have decided to get together to serve Cameroon football diligently. According to the Inter Milan striker, Roger Milla is a ‘living god of football’. In reaction Milla also lavished appreciation to the one he calls his son. Eto’o equally lamented about the catastrophic outing in South Africa and affirmed that the team has turned the page and now looks towards the future. The dove of peace continued its flight as Milla reconciled with Mohammed Iya, president of FECAFOOT during the inauguration ceremony of the new leaders of the DTN. ouf!! enfin une bonne nouvelle du football camerounais! Dat’s cool.Mr Milla,you are a football legend but watch the way you talk.Je suis content pour toi Eto’o et aussi content pour la reconciliation.Kamerun o bosso!! !